While STEM grads are currently hitting the job market at full force, another group of job seekers are also starting their career: The graduate from the two-year technical college. Like STEM jobs, hot jobs for those with two-year technical backgrounds include air traffic controller, nuclear technician, computer programmer, and electronic engineering technician. Translation: Skilled workers with both two and four year degrees are in demand. But skilled workers with the education, and the right soft skills, are the one’s getting hired. With thousands of STEM or technical school grads now in the workforce, employers hiring recent college grads or entry-level employees are looking for more than just the right educational background. 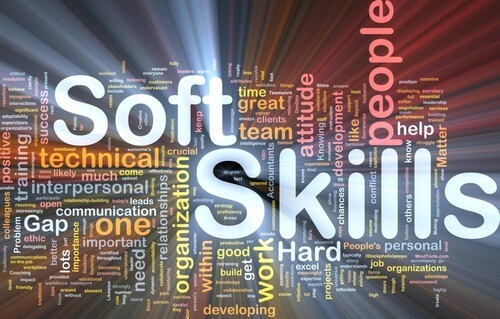 In fact, those who get hired often stand out because of the soft skills they are able to articulate in an interview. This may be why chief information officers (CIOs) surveyed by staffing firm Robert Half Technology named communication skills (28 percent) and problem-solving abilities (21 percent) as the top areas where skilled and technical professionals could improve. Brown agrees. Recruiters are looking for the job seeker who has something extra to bring to the team, whether it’s a personality that fits corporate culture, or the ability to make an impact beyond a basic job description: Someone who is a team player, willing to help out even if it isn’t part of the daily routine, or someone who shines bright and empowers those around them. 1. Communication Skills: Regardless of the type of organization one works for, effective communication across all levels is a critical soft skill for technical new grads. This is especially important in larger organizations, like Kerry for example, which have a complex matrix organizational structure. What is a matrix organization? According to study.com: A matrix organizational structure is a company structure in which the reporting relationships are set up as a grid, or matrix, rather than in the traditional hierarchy. In other words, employees have dual reporting relationships – generally to both a functional manager and a product manager. Can you do your work – and communicate technical information in a non-technical manner to others on the team, or across the organization? That’s important. Large organizations have teams, reporting structures, and chains of command to follow. Being a part of that team, and working with others outside your team, and understanding how to fit in goes a long way towards success. 3. Professionalism: The ability to navigate a corporate environment, meet deadlines, conduct meetings, and contribute helps give recent college grads credibility in any role. Show up on time, do your job, ask appropriate questions, don’t make excuses. That’s a good start. 4. Leadership: Those who are able to lead and influence without the authority that comes with a title go the furthest, says Brown. Many entry-level employees don’t focus on developing leadership skills early in their career. But finding a mentor can assist with the leadership development process. 5. Consultative and presentation skills: These skills “can take you far regardless of level (or career path),” says Brown. Consultative skills focus on behaviors that deliver consultative value to internal customers and external clients. Brown looks for recent college grad with those types of unique skills when recruiting and hiring those with technical backgrounds. She was once one of those consultative employees with a technical background, needing to succeed with non-technical co-workers and teams. She recruited employees for a company that provided customized technical services and platforms to huge companies around the globe. “This was challenging because we were subject matter experts in designing and building customized MS solutions, which took very specific technical skills, but much of what we did was onsite at the customer site which required soft skills like a sales person might have,” says Brown. How can recent college grads develop consultative or presentation skills? Joining industry associations or networking groups, and becoming an active member is one way. Volunteering at industry events is another way. For many college students, there is nothing more daunting than earning a STEM degree, or completing a technical degree. Now that you are graduated, you need to take it to the next level. Start by mastering these soft skills to stand out, get noticed, and get hired. When you do, a great salary, and great career opportunity awaits. Want more tips and advice on the important skills recruiters covet? Stay connected to College Recruiter by visiting our blog, and connect with us on LinkedIn, Twitter, Facebook, and YouTube.